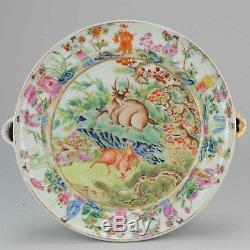 19C Chinese porcelain Polychrome hot water plate flowers figures deer Marked Stamp. A very nice and stunningly painted polychrome porcelain hot water plate decorated with flowers, figures and deer. Marked with seal stamp at base. Overall Condition B; 1 line on body and 1 handle has 2 chips. Size 267mm diameter and 60mm high approx. 19th century Qing (1661 - 1912). We can not control this. The item "19C Chinese porcelain Polychrome hot water plate flowers figures deer Marked" is in sale since Thursday, April 5, 2018. This item is in the category "Antiques\Asian Antiques\China\Plates".